Special design credit to Chris Simon for allowing me to use a modified version of her Lace Petals flower. If you would like to print this pattern for personal use, please use the PrintFriendly button at the bottom of the page. Using worsted weight yarn and dc stitches: 8 rows and 18 st’s per 4” (10 cm) square. 16.5” (42 cm) in diameter. Crab stitch – This stitch is also known as the reverse single crochet. See this tutorial. Popcorn stitch: Make 5 dc’s in the same stitch. Remove your hook from the last stitch. Insert your hook into the first dc of the 5 dc’s. Grab the last stitch with your hook and pull it through the first stitch. Ch 1. See this tutorial. Standing Stitches – Standing sc’s, hdc’s, and dc’s are stitches used to start the round without the need for the traditional beginning chain. Links to tutorials are supplied in each relevant round. Into a magic ring: ch 4 (this counts as your first dc and ch 1) and then make a dc. (Ch 2, dc, ch 1, dc) five times. Ch 2 and join to the third st of the beginning ch-4 with a sl st. You should now have 6 ch-1 spaces, 6 ch-2 spaces and 12 dc’s. If you are not familiar with working into a magic ring, this video tutorial by Tamara from Moogly is very good. Please remember when working into a magic ring, you HAVE to work away your initial tail very well. If you just cut it, your whole project might unravel! If you are going to use the same colour for Round 2, sl st into the next ch-1 space, ch 1 and sc in the same space. If you are going to use a new colour for Round 2, join your new yarn by making a standing single crochet in any ch-1 space around. (Make 5 dc’s in the next ch-2 space, sc in the next ch-1 space) five times. Make 5 dc’s in the last ch-2 space. Join to the first sc with a sl st. If you are using the same colour, ch 1 and make a fpsc around the post of the same sc. If you are using a new colour, join your new colour with a fpsc around the post of any sc from the previous round. You will make the fpsc exactly the same as the standing single crochet, but working around the post of the stitch instead of into the top 2 loops. *(Dc, ch 1) in the next 4 dc’s. Dc in the last dc. Fpsc in the next sc. * Repeat from * to * 5 times. Omit the last fpsc on the last repeat. Join to the top of the first sc with a sl st. If you started with a standing fpsc, you might find it tricky to join to it with a sl st. Pull the beginning tail of yarn so that you can see the top loops of the stitch. If you cannot manage to poke your hook through both loops, you are more than welcome to join to the FLO of the standing fpsc. You should have 6 petals, each containing 5 dc’s and 4 ch-1 spaces, and a fpsc between petals. Round 4 is simple, but you have to concentrate! I had to frog this round a few times because I either forgot the ch-1′s or I made the stitches in the wrong spots. If you are using the same colour, ch 1 and fpsc around the post of the same fpsc as the sl st join. If you are using a new colour, start with a fpsc around the post of any fpsc around. *Hdc in the first dc and then ch 1. This first dc might be slightly tricky to get into because it is right next to the fpsc. (Dc in the next dc, ch 1, dc in the next ch-1 space, ch 1) twice. Dc in the next dc and then ch 1. Hdc in the last dc and fpsc in the next fpsc. * Repeat from * to * 5 times. Omit the last fpsc on the last repeat. Join to the first fpsc with a sl st. Fasten off and change colours. You will not be working into the hdc’s in this round. You will skip the first and last hdc of every petal. Join your new yarn by making a standing single crochet around the back of the post of the last dc of any petal around. Phew…I say “of” a lot in that sentence! Hehe. You are basically starting with a standing back post sc, if such a thing exists. *Ch 2 and fpdc around the post of the fpsc between the petals. (Ch 2, bpsc around the post of the next dc) 5 times. * Repeat from * to * 5 times. Omit the last bpsc of the last repeat. Join to the first bpsc with a sl st. If you are going to use the same colour, sl st into the next ch-2 space. Ch 5 (this counts as the first dc plus ch-2) and dc in the next ch-2 space. These 2 dc’s should fall on either side of the fpdc from the previous round. If you are going to use a different colour, start with a standing double crochet in the next ch-2 space. Ch 2 and dc in the next ch-2 space. These 2 dc’s should fall on either side of the fpdc from the previous round. *Ch 2 and hdc in the next ch-2 space. (Ch 2, sc in the next ch-2 space) twice. Ch 2, hdc in the next ch-2 space. (Ch 2, dc in the next ch-2 space) twice. * Repeat from * to * 4 times. Ch 2 and hdc in the next ch-2 space. (Ch 2, sc in the next ch-2 space) twice. Ch 2 and hdc in the next ch-2 space. Ch 2 and join to the third ch of the beginning ch-5 (or the standing double crochet) with a sl st.
Notice that the dc’s fall on either side of the fpdc’s from the previous round. If you are going to use the same colour: sl st into the next ch-2 space. Ch 1 and make 2 sc’s in the same ch-2 space. If you are going to use a different colour, start with a standing single crochet in the next ch-2 space and then make another sc in the same ch-2 space. Make 2 sc’s in the next ch-2 space. Make 3 sc’s in the next ch-2 space. *Make 2 sc’s in each of the next 2 ch-2 spaces, make 3 sc’s in the next ch-2 space. * Repeat from * to * 10 times. Join to the BLO of the first sc with a sl st.
You will be working in the back loops only (BLO) for this round. If you are going to use the same colour, ch 2 (this counts as your first hdc). If you are going to use a different colour, start with a standing hdc in the BLO of the same st as the sl st join. Hdc in the BLO of the next 5 st’s and make 2 hdc’s in the BLO of the next st. *Hdc in the BLO of the next 6 st’s, make 2 hdc’s in the BLO of the next st.* Repeat from * to * 10 times. Join to the top of the beginning ch-2 (or the standing hdc) with a sl st. If you are going to use the same colour: Ch 5 (counts as the first dc and ch-2) and then dc in the same st. This is your first V-stitch made. Ch 1. If you are going to use a different colour, start with a standing double crochet in the same stitch as the sl st join, then ch 2 and dc in the same st. This is your first V-stitch made. Ch 1. *Skip 3 st’s, make a V-stitch in the next st, ch 1. * Repeat from * to * 22 times. Join to the third ch of the beginning ch 5 (or to the top of the standing double crochet) with a sl st. Note: In this round, you will only be working into the ch-2 spaces, in other words, the space between the 2 “legs” of each V-stitch. If you are going to use the same colour, sl st in the next ch-2 space, ch 1 and sc in the same space. If you are going to use a different colour, start with a standing single crochet in the next ch-2 space. *Make 4 tr’s into the next ch-2 space. Ch 3 and sl st in the third ch from the hook. You should now have a little picot at the top of the fourth tr. Make 4 more tr’s into the same ch-2 space. Sc in the next ch-2 space. * Repeat from * to * 11 times. Omit the last sc on the last repeat. Join to the first sc with a sl st. Fasten off and change colours. Optional: if you would like to give the petals more definition, feel free to work into the BLO in this round. Join your new yarn by making a standing half-double crochet in the first tr of any petal around. 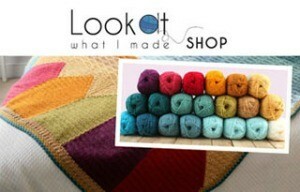 If you have trouble identifying which loops belong to which stitch, see this tutorial. It touches on the anatomy of stitches when working in the round. After making your first hdc, sc in the next tr of the petal. Ch 6. Sc in the seventh tr of the petal and hdc in the last tr. Dc in the sc between petals. *Hdc in the first tr of the next petal and sc in the next tr. Ch 6. Sc in the seventh tr of the petal and hdc in the last tr. Dc in the sc between petals. * Repeat from * to * 10 times. Join to the standing hdc with a sl st.
Stitch count: 12 dc’s, 24 hdc’s, 24 sc’s, and 12 ch-6 spaces. If you are going to use the same colour, ch 1 and sc in the same st. Then sc in the next st. If you are going to use a different colour, start with a standing single crochet in the same st as the sl st join and then sc in the next st.
*Make 6 sc’s in the ch-6 space behind the petal. Sc in the next 5 st’s. * Repeat from * to * 10 times. Make 6 sc’s in the last ch-6 space and then sc in the last 3 st’s. Join to the first sc with a sl st.
Notes: The first sc of each repeat will fall in the third sc made into the ch-6 space. The two 4-tr groups which form each petal will fall on either side of the dc in Round 11. When skipping the 3 st’s after the petal, be mindful of the fact that the first stitch to skip will be slightly hidden. If you are going to use the same colour, ch 4 (this counts as your first tr) and then make 3 tr’s in the same st. If you are going to use a different colour, join your new colour by making a sl st in the same st as the sl st join. Ch 4 (this counts as your first tr) and then make 3 tr’s in the same st.
*Skip 3 st’s (see Notes above). Sc in the next st. Catch the picot from Round 10 by inserting your hook into the second ch of the picot AND into the next st from Round 12 and completing a sc through both layers. Sc in the next sc. Skip 3 st’s. Make 4 tr’s in the next st. Make a picot (as in Round 10) and then make 4 tr’s in the next st.* Repeat from * to * 10 times. Skip 3 st’s. Sc in the next st. Catch the picot by making a sc through the picot from Round 10 and into the next st of Round 12 (as before). Sc in the next sc. Skip 3 st’s. Make 4 tr’s in the last st. Make a picot. Join to the top of the beginning ch-4 with a sl st. Fasten off and change colours. Optional: if you would like to give the petals more definition, feel free to work into the BLO in this round. Join your new yarn by making a standing half-double crochet in the first tr of any petal around. Sc in the next tr of the petal. Ch 6. Sc in the seventh tr of the petal and hdc in the last tr. Dc in the next sc, fpdc around the picot from Round 10, dc in the last sc. *Hdc in the first tr of the next petal and sc in the next tr. Ch 6. Sc in the seventh tr of the petal and hdc in the last tr. Dc in the next sc, fpdc around the picot from Round 10, dc in the last sc. * Repeat from * to * 10 times. Join to the standing hdc with a sl st.
Stitch count: 24 dc’s, 12 fpdc’s, 24 hdc’s, 24 sc’s, and 12 ch-6 spaces. Round 15 is the same as Round 12, but with more sc’s. *Make 6 sc’s in the ch-6 space behind the petal. Sc in the next 7 st’s. * Repeat from * to * 10 times. Make 6 sc’s in the last ch-6 space and then sc in the last 5 st’s. Join to the first sc with a sl st. Hint: The hdc’s worked into the picots should fall in the 4th sc in the ch-6 space. If you are going to use the same colour, sl st into the next st and then ch 2 (this counts as your first hdc). Hdc in the next 3 st’s. If you are going to use a different colour, start with a standing half-double crochet in the st after the sl st join. Hdc in the next 3 st’s. *Catch the picot by making a hdc through the picot from Round 13 and into the next st of Round 15 (as before). Hdc in the next 5 st’s, fptr around the post of the fpdc from Round 14. Skip the next st of Round 15 and Make 2 hdc’s in the next st. Fptr around the same fpdc from Round 14. Skip the next st of Round 15 and hdc in the next 4 st’s. * Repeat from * to * 11 times. Omit the last 4 hdc’s on the last repeat. Join to the top of the beginning ch-2 (or standing hdc) with a sl st. If you are going to use the same colour, ch 1 and sc in the same st. Sc in the next 4 st’s. If you are going to use a different colour, start with a standing single crochet in the same st as the sl st join. Sc in the next 4 st’s. *Fpdc around the picot from Round 13. Skip the next st from Round 16 and sc in the next 6 st’s. Make 2 sc’s in the next st. Sc in the next 6 st’s. * Repeat from * to * 11 times. Omit the last 5 sc’s on the last repeat. Join to the top of the first sc with a sl st. In the next 3 rounds Sophie has a tendency to buckle. This will correct itself in Rounds 21 and 22, so don’t worry about it. If your stitch count is spot on, you’ll be fine. Remember that the 5-dc popcorn stitch is closed with a ch st. If you are going to use the same colour, sl st into the next 3 st’s so that you end up in the second sc before the fpdc. Ch 2 (this counts as your first hdc). Hdc in the next st. If you are going to use a different colour, start with a standing half-double crochet in the second sc before any fpdc from the previous round. Hdc in the next st.
*Make a popcorn stitch in the next st (which will be the fpdc). Hdc in the next 4 st’s. Fptr around the fptr from Round 16. Skip the next st of Round 17. Hdc in the next 2 st’s. Make 2 hdc’s in the next st. Hdc in the next 2 st’s. Fptr around the fptr from Round 16. Skip the next st of Round 17. Hdc in the next 3 st’s. * Repeat from * to * 11 times. Omit the last 2 hdc’s on the last repeat. Join to the top of the beginning ch-2 (or the standing hdc) with a sl st. Hint: There are 12 repeats of 16 st’s. If you want to check that you aren’t skipping/adding stitches, the first st of each repeat should fall in the popcorn stitch. Identifying which “loops” to work into for the popcorn stitch: for the purposes of this pattern, the “top” of the popcorn stitch will be the first dc of the 5-dc’s used to create the popcorn. You will find the loops for this stitch to the right of the popcorn (to the left if you are left-handed). If you are going to use the same colour, sl st to the popcorn stitch. Ch 3 (this counts as your first dc). If you are going to use a different colour, start with a standing double crochet in any popcorn stitch around. Dc in each st around. Join to the top of the beginning ch-3 (or the standing double crochet) with a sl st. If you are going to use the same colour, ch 3 (this counts as your first dc). Dc in the next 3 st’s. If you are going to use a different colour, start with a standing double crochet in the same st as the sl st join. Dc in the next 3 st’s. *Fpdtr around the fptr from Round 18. Skip the next st of Round 19. Dc in the next 10 st’s. Fpdtr around the fptr from Round 18. Skip the next st of Round 19. Dc in the next 4 st’s. The first dc should fall in the dc in the top of the popcorn stitch. * Repeat from * to * 11 times. Omit the last 4 dc’s on the last repeat. 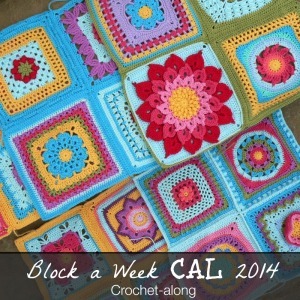 Join to the top of the beginning ch-3 (or the standing double crochet) with a sl st. If you are going to use the same colour, ch 3 (this counts as your first dc). Dc in the next st. If you are going to use a different colour, start with a standing double crochet in the same st as the sl st join. Dc in the next st.
*Make 2 dc’s in the next st. Dc in the next 3 st’s. The last dc should fall in the dc after the fpdtr from the previous round. (Ch 2 and make a cluster) three times. Ch 2 and dc in the next 3 st’s. * Repeat from * to * 11 times. Omit the last 2 dc’s on the last repeat. Join to the top of the beginning ch-3 (or the standing double crochet) with a sl st.
At this point, the “petals” formed by your front post stitches are almost complete. In this round, you will be forming the points of the petals. Do not worry if your mandala starts to curl in this round, it will straighten out in the next round. If you are going to use the same colour, ch 1 and sc in the same st. Sc in the next 2 st’s. If you are going to use a different colour, start with a standing single crochet in the same st as the sl st join. Sc in the next 2 st’s. *Fpdtr around the fpdtr from Round 20 to the left of the popcorn stitch (right, if you are left-handed). Fpdtr around the fpdtr from Round 20 to the right of the popcorn stitch (left, if you are left-handed). Skip the next st of Round 21. Sc in the next 3 st’s. (Make 2 sc’s in the next ch-2 space, sc in the top of the next cluster) three times. Make 2 sc’s in the last ch-2 space. Sc in the next 4 st’s. * Repeat from * to * 11 times. Omit the last 3 sc’s on the last repeat. Join to the first sc with a sl st. When working around the fpdtr’s from the previous round, you will make one fpdc around both posts (together) and skip the tops of these 2 st’s. If you are going to use the same colour, ch 3 (this counts as your first dc). Dc in the next 2 st’s. If you are going to use a different colour, start with a standing double crochet in the same st as the sl st join. Dc in the next 2 st’s. *Make a fpdc around the posts of both fpdtr’s from Round 22. Dc in the next 18 sc’s. Don’t accidentally skip the first sc after the fptr’s. * Repeat from * to * 11 times. Omit the last 3 dc’s on the last repeat. 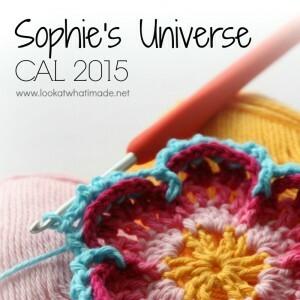 Join to the top of the beginning ch-3 (or the standing double crochet) with a sl st. In this round, you will be making increases by working into the loops of the fpdc’s AND around the posts. If you are going to use the same colour, ch 1 and sc in the same st. Sc in the next st. If you are going to use a different colour, start with a standing single crochet in the same st as the sl st join. Sc in the next st.
*Hdc in the next 2 st’s. The last hdc should fall in the top of the fpdc from the previous round. Fpdc around the post of the fpdc from the previous round. Hdc in the next 2 st’s. Sc in the next 15 st’s. * Repeat from * to * 11 times. Omit the last 2 sc’s on the last repeat. 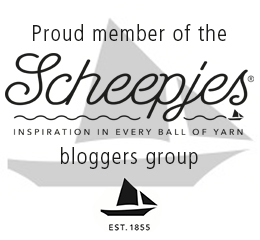 Join to the first sc with a sl st. Fasten off and work away your tails of yarn. Start in any stitch around with a standing single crochet. Make a crab stitch in each st around. If you are not familiar with the crab stitch, see this video tutorial. When you get to the end of the round, make a crab stitch in the same stitch as the standing single crochet. No need to join with a sl st. In fact, I’ll give you an apple if you manage to do it! Just fasten off and work away your tail of yarn. 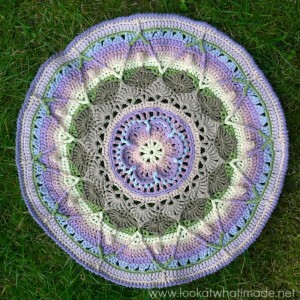 I would like to change the Sophie Mandala into a square when finished. Is there a pattern. The patterns for turning the mandala into a square (and then a continuous blanket, if you like) can all be found HERE. Part 4 is the squaring up bit. Merci, pour ce beau modèle de mandala c’est rare d’en trouver des larges, bien hâte de l’essayer. I absolutely looovvveeeee this pattern! Thank you so very much for sharing. 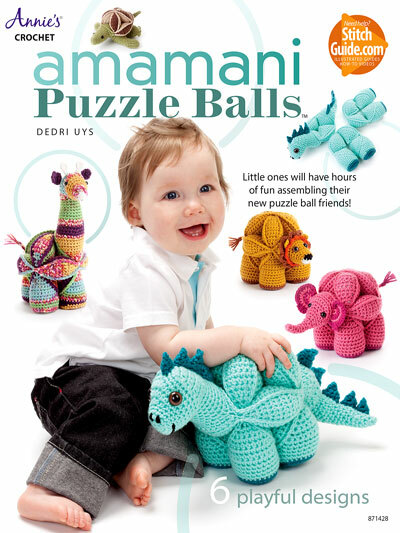 I am going to make this for my daughter who loves this kind of thing and know that she will cherish it always. Again, thank you! I stumbled upon this on pinterest and my heart stopped! This is absolutely stunning! 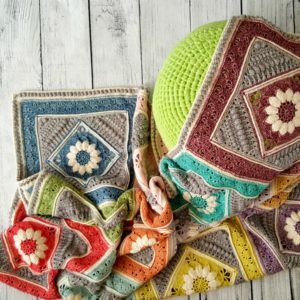 My question is, is there a way to make this pattern blanket sized? How would I go about doing that? Hi – is there step by step photos to go with the above steps ? Christa, at the start of the written-only pattern there are links to each of the 3 photo tutorials that accompany the pattern. I thought the way you wrote the pattern was very clear and concise plus a very beautiful, fun pattern. I think if you are a beginner, this pattern might be a little tough to take on. Thank you for sharing this. Thank you, Patty. It will be tough, because it is not an easy pattern, but I continue to be amazed at the amount of beginners that manage to follow the instructions. This was the first crochet pattern my sidekick Jenny followed when she decided to swap her knitting needles for a crochet hook for a bit. She frogged a lot, but she made the whole garden and it was beautiful. I ran on to this pattern and I think it is just absolutely beautiful. i am on another project now but can’t wait to try this one. In fact I might just put the other one to the side and at least make the Mandala. I couldn’t find the colors that you used for the entire project. Would it be possible to get the colors that you used because they are so beautiful together? Thank you for sharing this pattern. Hi Bobbi and thank you for your lovely comment. You can find a list of the colours I used HERE. 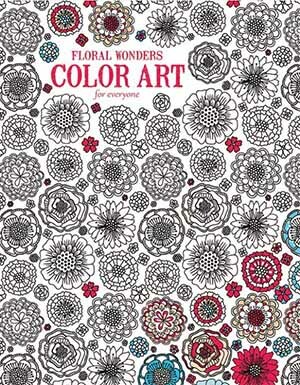 The list is actually for the whole “garden”, but if you look at the first 25 rounds you will find the colours for the mandala. I absolutely love this pattern and the colors used. I am currently working on it and though I love seeing the progress I have to say that some of the pattern is written much more difficult than it needs to be. I appreciate the thoroughness of it because god knows there is patterns that don’t explain nearly enough and you are left guessing…..but the way this is written sometimes seems to make it more difficult and if it’s a longer repetition of stitches you have to read hte paragraph all over again and figure out the puzzle lol. I have been making myself little cheat sheets for each round once I figure out what needs to be done for example round six “into only ch 2 spaces dc, ch 2, hdc, ch 2, sc, ch 2, sc, ch 2, hdc, ch 2, dc, ch 2, for each pedal”. Minor nuisance for such a lovely pattern, but thought I’d maybe just give a tip to others if they were having the problem I am. Tracy I appreciate your feedback and am sorry that you find the pattern hard to follow. It is extremely hard to write a pattern that will appeal to everyone’s reading style. My target audience is beginners and this particular pattern is more of a “how to crochet” course than an actual pattern. I want everyone to be able to make Sophie regardless of their skill level and the joy people get from accomplishing something they thought way above their skill level is absolutely invaluable to me. The reminders of where certain stitches should fall (although tedious to read on each repeat) are essential to avoid frogging later on, if you keep in mind the skill level of the audience I am catering for. I am glad that you have managed to make your own cheat sheets and hope that they will help make the pattern more pleasurable for you if you ever do attempt it again. I think I might have to retract some of my comment lol. When I wrote the above review I was only on round six and many of the instructions seemed redundant. I guess because they were pretty easy short rounds, but when I got up into the higher numbered rounds with longer stitch patterns it sure came in handy and I got used to it. 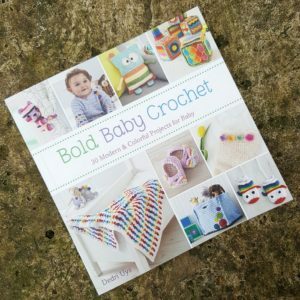 I am not new new to crochet, but not a pro either, so I understand where you are coming from wanting to appeal to every level. 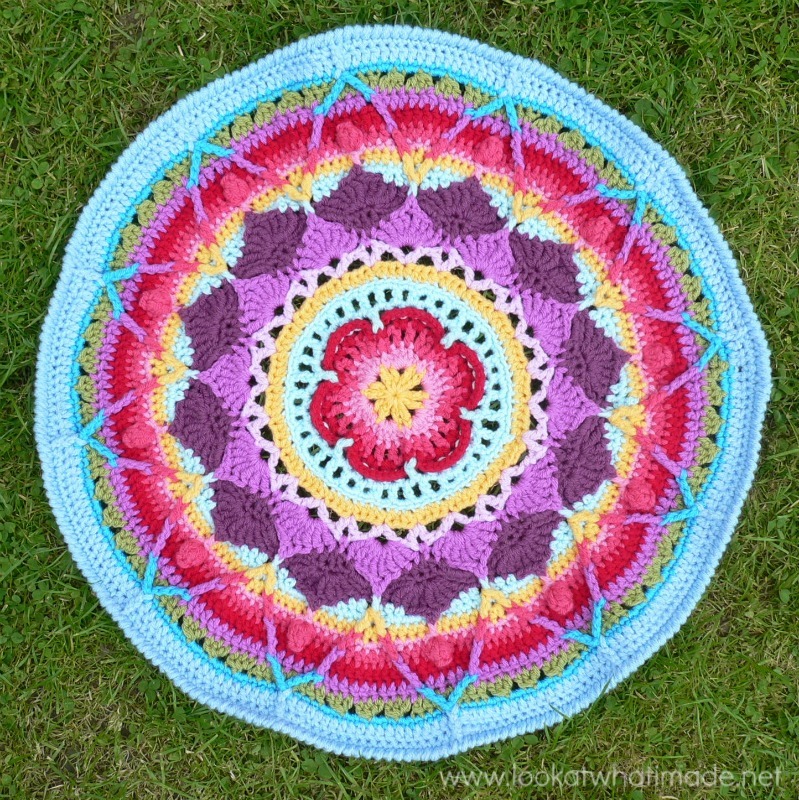 I just finished Sophie’s Mandala yesterday, going onto Sophie’s Garden right now, this project marks my one year of crochet. 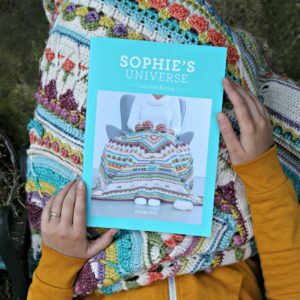 I do appreciate the detailed instructions because I did have to click the links to a few of the special stitches to learn them or get a refresher……and these type of details in patterns are what helped me get to the level I am today. I still make quick notes to use as a quick reference during each round but the details are definitely appreciated. I didn’t keep them, but they only take 2 seconds to type up so it’s no biggie when I make this again…..which I definitely will. I saw one done in all white made into a pillow with a red lining behind it and it looked just awesome. Keep up the good work, I look forward to doing more of your patterns. 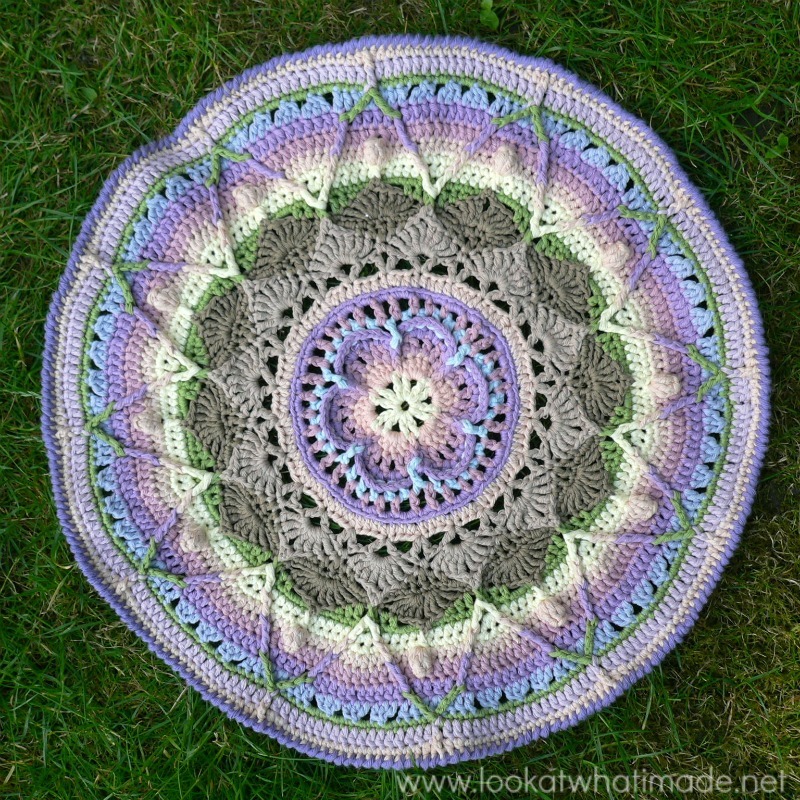 This is absolutely GORGEOUS omg ty so much =) I am thrilled you shared your beautiful pattern! 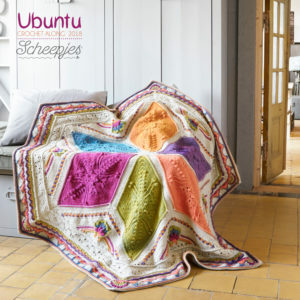 I have been looking for something stunning to make for myself and I cant wait to do this one! =D Amazing work ty again for sharing!! Hi, love this pattern!!! I’ve been looking for a communal-garden ready-made rug for my living room, but this is SOOOOO much better and I can make it any combination of colours I like. However, I think I must be being a bit dense – the pattern says the materials needs is approx. 250 meters/275 yards. Really? For the whole rug or each colour? It doesn’t seem enough. I’m confused.com! Hi Penny. This square is only 16.5″ (using worsted weight and a 4 mm hook) and will need 450 meters (thank you for picking up that I’d included the wrong yardage). 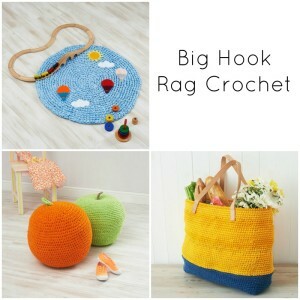 To make a large rug, you will need to use 4-8 strands of yarn together and a really big crochet hook (like a 10 mm). Then you will use anywhere from 1 kilogram of yarn to 2 kilograms, giving you a rug of roughly 80 cm (35″). This is beautiful! I hope I can do it! I am so excited about this pattern! I could kiss you! LOL I was just going to begin a search for Mandalas…rug size! I think I’ve found it! 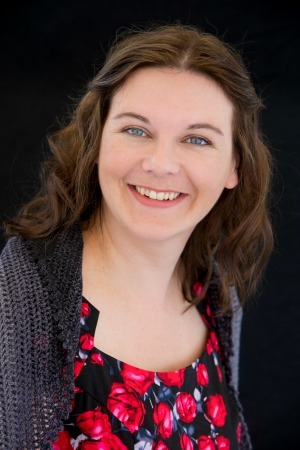 Jessie from http://jessieathome.com/ just posted it on FB and Twitter. Thank you so much for the pattern!